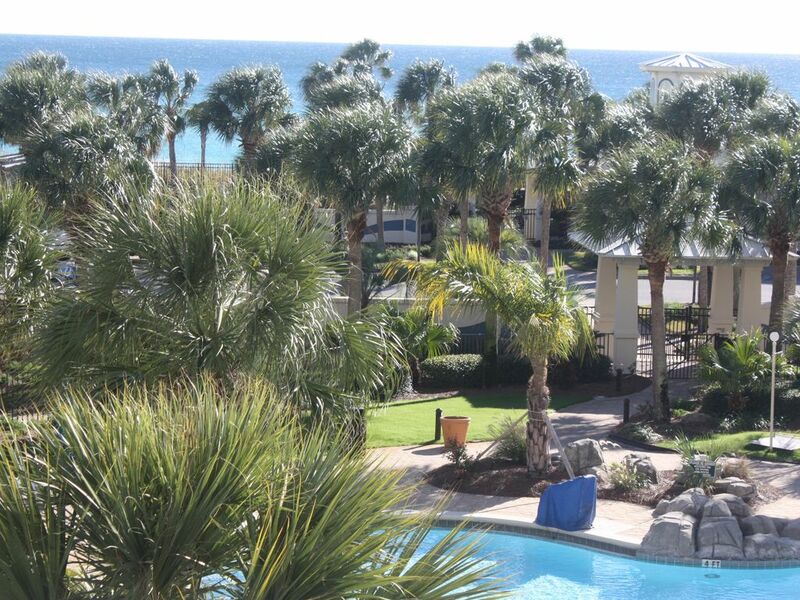 STERLING SHORES DESTIN, FL ONE BEDRM CONDO RENTAL LOCAL OWNER GULF VIEW! Gulf of Mexico OceanView! We are local owners who personally rent and manage our Sterling Shores Condominium. NO HIDDEN FEES! BEST DEAL IN STERLING SHORES! All new appliances December, 2017. We are able to rent Saturday to Saturday only during our busy summer season. We look forward to excelling in customer service. Your vacation is very important to us. Let us help you make lasting family memories. Your DESTIN, FLORIDA beach getaway. There are only 8 one bedroom vacation rentals in the 160 - unit Resort. SEE OUR ONE BEDROOM STERLING SHORES vacation condominium On YouTube search on the internet: 'Sterling Shores Unit 312'. Our beautiful designer-decorated, one-bedroom, one-bath, NON-SMOKING/NO PETS Sterling Shores condominium home is located in the vacationer's seascape of fabulous, fun Destin, the deep-sea fishing capital of the Gulf Coast. Enjoy beautiful condo living open to the serenity of the sea. We have created your oasis in Paradise for leisurely days packed with as much excitement or relaxation as you choose. The pleasures of a 240-ft. gulf front private beach and club with a refreshing oasis pool right on the sand are steps way. A sparking 4300 s. f. lagoon zero entry pool, endless decks and tropically landscaped gardens, and even a 42-seat surround sound movie theater offer you beach life at its finest. There is also a nicely equipped fitness room. Adjacent to Henderson Beach State Park and one mile of State beach. Walk to the Back Porch, and other restaurants and amusement parks including The Track and Big Kahuna's. Great golf, fishing, and shopping, including Destin Commons, Baytown Wharf, Grand Boulevard & Silver Sands Outlet, one of the nation's largest designer outlet malls, all are close by. We live in Destin and are glad to help with your vacation questions. We offer an exceptionally clean, personally maintained, and comfortable, smoke-free/pet-free, vacation environment. We look forward to your vacation visit. Our rates are all-inclusive. WE LOVE DESTIN! We live in Destin and are business owners here. We personally manage and maintain our Sterling Shores Gulf of Mexico ocean view vacation condominium home, and will meet you during your visit. We enjoy sharing our bit of paradise with our guests from a locals point of view. Our goal is to help make this your favorite beach vacation ever with special tips on fishing, golf, restaurants, shopping, hiking, and adventures of all kinds. Family memories are what brought us here to live permanently in 1995, and we want your family memories to bring you back again and again! We are very proud of the like-new condition in which we keep our Gulf of Mexico ocean view condominium. WE ARE NOT A MANAGEMENT COMPANY; we are the original owners and live in Destin. Great location near The Track and Big Kahunas. Restaurants close enough to walk. Back Porch is a favorite of our family and is across the street with a great Gulf front view. Sterling Shores has two pools--one is gulf front and the other is a free form fabulous fun for everyone masterpiece. We hope you will visit soon! We are local owners who want to save you money!! Sterling Shores is a 'stay and play' vacation destination. Walk to the Back Porch Restaurant, and Candy Man's for breakfast. Very near recreation destinations of Henderson Beach State Park, Destin's Morgan Sports Center, Big Kahuna's and The Track. Great grocery stores and markets with WalMart within one mile and The Fresh Market and the new Whole Foods (next to Bass Pro) , are wonderful 'foodie' experiences close by as well. Publix is less than two miles. Destin is a shopper's dream with the largest designer outlet mall in the country and dozens of boutiques to suit your individual fashion sense. Fine, award winning dining abounds including many of Florida Trends top picks or well as casual, waterfront restaurants that welcome bathing suits and bare feet. There are even restaurants with playgrounds right on the beach. If you prefer natural beauty with miles of sugar white beaches and award winning state parks with miles of hiking trails with some of Florid'a highest sand dunes and coastal fresh water lakes are here too. Sterling Shores has 300' of private deeded gulf access and a beautiful gulf front pool. Sterling Shores is conveniently located near restaurants, entertainment (Big Kahunas and The Track), grocery stores ( Publix, Walmart, Winn Dixie, Fresh Market, and Whole Foods), movies and shopping. We have an unobstructed ocean view of the beautiful Gulf of Mexico! Please see the photos taken from the balcony. Enjoy! unassigned outside parking for car. No boats or trailers. NEW SYSTEM INSTALLED Jan, 2017! initial bandwidth of 100 to 200 mbps, which is two to four times faster than the fastest that can be purchased directly from Cox Communications. YES! NEW equipment for 2018. Located on second floor. Coded lock access for entry. New System one of best and fastest in the area! You will notice the difference! Included FREE! Sterling Shores Resort has elevators in the middle of the building and also on both ends. Very convenient! Easy stairway access as well. Beautifully furnished, tiled for easy beach living, comfortable sofa sleeper, fabulous steel case chair, large flat screen television. Wonderful gulf view. One of only eight one bedroom condos. We have a breakfast bar that seats four and also a small table with two chairs for games, puzzles or extra dining. Sterling Shores is beautifully landscaped with palm trees, well manicured lawns, and many blooming shrubs. Located on nine acres. Beautiful direct ocean views of the Gulf of Mexico and pools. Door to door rental available. Wonderful Gulf of Mexico ocean view from the patio third floor location, overlooking the landscaped pools and beach. Comfortable outdoor seating for relaxing and dining. Destin is a golf destination. Kelly Plantation, Regatta Bay, Indian Bayou, Seascape, The Golf Garden and Sandestin Golf Courses are close by. (2) Fabulous pool with huge sun deck and tropical landscaping. Mushroom fountain and zero entry feature. Perfect for families! Second pool heated in winter is on the beach with small restaurant, which is serving Spring, Summer and early Fall. Also, The Back Porch restaurant is next door! On 9 acres of tropically landscaped land, 2 Pools, one of which is on the beach, Gas Barbecue grilling area next to the large pool, 42-seat Surround-sound Movie Theatre, gated community, new exercise facility. Perfect room for a couple. The view was amazing and in a convenient location to many local attractions. Bed was very comfortable and home was clean and welcoming. We really enjoyed our week at Sterling Shores unit 312. The owners were very friendly, knowledgeable, and their gift of a key lime pie was the topper. The unit had everything we needed. The bedroom was a little small, but the large bathroom and living area made up for it. It was a short walk through a courtyard to the private beach where we enjoyed many hours. The Fiores gave us many suggestions for hiking and for dining which we were able to enjoy. Overall this was a very nice place and we hope to be back someday. This unit was a fantastic one bedroom. The bedroom was a little small, but we were still able to fit a pack ‘n’ play in the corner. The unit was very clean and well decorated and the zero entry pool was a big hit with my 2 year old! The location is extremely convenient for all kinds of dining options. Overall it was a great trip and we would stay here again! Thank you for visiting our beach community, Kathy, and for staying with us in Sterling Shores #312. We are local owners and your vacation is very important to us. We hope to welcome you again. We stay current with local events, so let us know if we can help with your future plans. We send our warmest Destin regards for safe travels where ever you may roam with hopes, that when you are in Destin, you will make our condominium your home! We enjoyed our stay very much. The condo was clean. The kitchen was very functional; stocked with any cooking utensil you could ever need!! The pool and beach access are very convenient and easy! We would definitely stay here again. Thank you, Amy. We enjoyed having you and hope you will return often. The beach is beautiful all year, and today, September 21st, the water temperature was 84! And the water was clear as, well, water! Just awesome! It is kind and thoughtful of you to take your time to review our vacation condominium home. Your vacation will always be important to us. The owners were very helpful and pleasant. The unit was nicely decorated and the few minor items they needed attentIon were fixed quickly. Thank you, Kerry. It was great having a former maintenance professional in our beautiful one bedroom sterling shores vacation condominium home. Our all new appliances are just one example of our efforts to give our vacationing families a wonderful Destin beach experience. July is a very busy time and we appreciate the opportunity to address your concerns with the tub stopper and sprayer in the kitchen sink and the number of towels provided by our housekeeper. It is a team effort! Thank you! Beach-combing,Shelling, Scuba, Snorkeling, Dolphin Watching, Reading, Photography, Beach-bumming, Building Sand Castles With Your Children, Making Family Memories, State and Federal Parks and historic sites, Naval and Air Force museums. I am enclosing a few bits of information that I think might make your trip more enjoyable. Bicycle rentals: Bikes are Us has been in business for 25 years and told me they are the least expensive in the area. They deliver and pick up. Telephone 850-837-6947. There are several other rental companies as well if you wish to check rates and service. For pontoon rentals check with Aloha Pontoons located on the Destin Harbor 850-428-1013. Be sure to explore our beautiful harbor front and all the fishing boats and their catches. It’s fun! And free! We have an excellent library and also a Community Center. Both have activities for you to check out. Our state parks are awesome!! National treasures! Our beaches are world class, and our sugar white sand is famous. Take a hike or a walk or just go sit and gaze! Sublime! Check out Henderson Beach State Park, Tops’l (great place for bicycles and they have bike and kayak rentals there) Camp Helen, Deer Lake, and Grayton Beach for a start. If you have time travel the beach road from Navarre to Pensacola to see the Gulf Islands National Seashore; it is surely one of the prettiest beach front drives in the country. If you go, think about visiting Ft. Pickett National Monument. You may look all these up on the internet, of course. Florida State Parks has a wonderful web site. If you are 55 or older, look into getting a Golden Age Passport for free or reduced access to Federal properties. You might also enjoy visiting Pensacola and its rich history. Perhaps stop at the aviation museum there or walk to the top of the light house. Palofox Street has been recognized for its lovely use of downtown space and its historical significance. Don’t hesitate to look these up on the internet for additional details on anything that is of interest to you. For other day trips, we love Fairhope, Al. and Apalachicola which is east of Destin. Both are about a two hour drive each way and are small and lovely towns. Fairhope is very gentrified with baskets of flowers hanging from the street lamps. Apalachicola is more rustic and authentic with shrimp boats and a very active and busy oyster industry; oysters are still harvested with tongs by hand which is very unusual and one of only a few places they do this. Please also consider a 45 minute drive to Seaside. Perhaps have a beverage on the deck at Bud and Alleys. Drive a bit further to see Allys Beach and Rosemary Beach. The 30A area has become high end and popular. Seaside is one of the first towns to use urban planning and was featured some years ago on 60 Minutes. You can find more information on the internet about these places as well. For local organic grocery shopping, I hardly think you will find more options conveniently located than in our small community. Please look up Fresh Market and Whole Foods. Both are outstanding for selection and service as well as locations near Sterling Shores. Whole Foods is much larger, so lots of everything. However, we love them both. We also like Publix, and you might, too. There is a Wal Mart almost across the street from Sterling Shores. Please let me know what I have left out. We are available for your questions. I know you will have a fabulous time exploring! Have FUN!!! Call 850-650-2669 for help with questions. Absolutely nonsmoking. Absolutely no pets. Sterling Shores Association does not allow guest pets, and does not permit rental to persons under age 25 years unless accompanied by a person age 25 years or older. We are only able to rent Saturday to Saturday during our busy summer season. We always welcome your questions. We are local owners, and your vacation is important to us.